Innovation is defined as “the introduction of something new” and “a new idea, method, or device”. 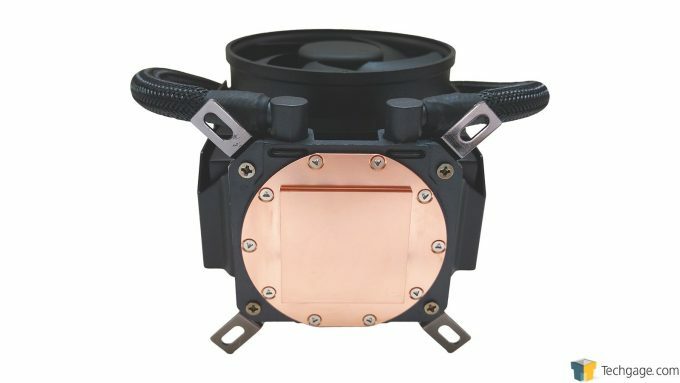 All-in-one liquid CPU coolers may not be new, but Cooler Master has the new idea and device portion covered with its MasterLiquid Maker 92 cooler. This innovative marvel is poised to change how coolers are designed, but it will have to fight an uphill battle against formidable air coolers. In the world of PC tech, the never ending race for the horizon continues on at breakneck speeds. This has resulted in key innovations in every aspect such as miniature high speed storage, blazing fast quad channel RAM, displays with out-of-this-world resolutions and refresh rates, and as is the case today, unique cooling solutions. 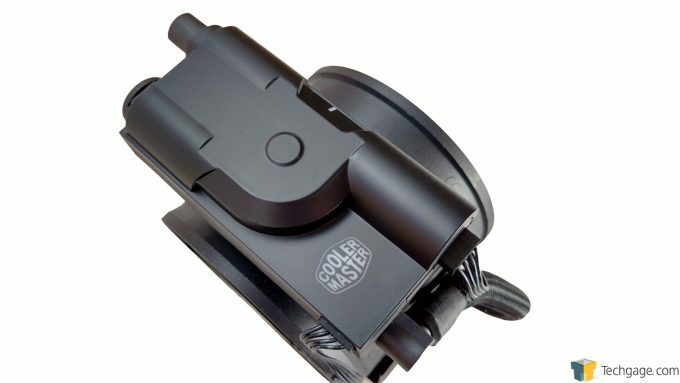 Up for review is Cooler Master’s new MasterLiquid Maker 92 compact all-in-one (AIO) liquid CPU cooler. This pint-sized innovation does away with the more standard design comprised of a block and pump combo unit and a separate radiator, and crams everything into a footprint that’s about the same size as most popular air coolers available today. Our tour of this Intel-only, LGA 2011v3 and LGA 115x cooler begins with an overall view, which shows dual 95mm fans in a push/pull configuration. Sandwiched between these fans is a 99.9mm aluminum radiator where heat is removed. The pump is hidden under the top cover and cycles fluid through the radiator and down to the copper block through the nylon-sleeved tubes. A more in-depth look shows the 4-pin fan connections, and a 5-pin port used to connect the cooler to the CPU fan header on the motherboard and a SATA power connector using the included cable. 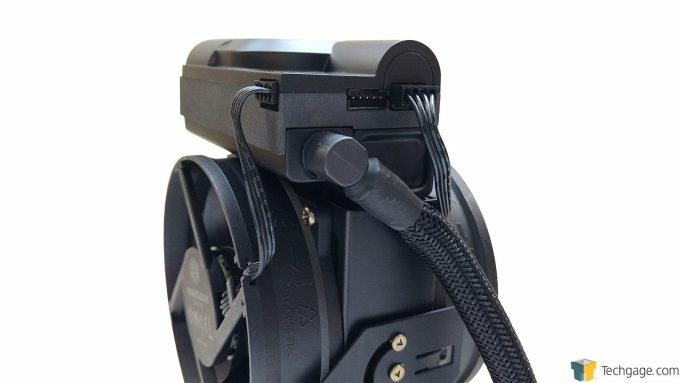 As mentioned earlier, the pump is hidden by the top cover that features a white LED indicator to show that the unit is active, along with the Cooler Master logo that is also lit by another LED. Moving to the opposite end we see the copper base that contacts the CPU. The finish is similar to that found on the MasterLiquid Pro all-in-one coolers, in that only the lightest machine marks are visible and it’s perfectly flat on both axis when checked with a straight edge. 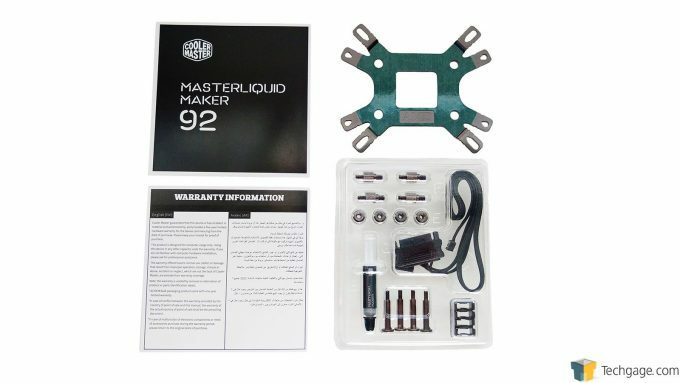 Included with the MasterLiquid Maker 92 is the installation guide, some detailed information on the 5-year warranty, and the combination Intel/AMD backplate used in other Cooler Master offerings, although again, this cooler is compatible with only Intel-based systems. Inside a two piece plastic pack is all of the mounting hardware for the various sockets, the 4-pin and SATA combo cable, and a small syringe of Cooler Master’s own thermal interface material. Due to the design of the MasterLiquid Maker 92, it’s recommended that installation be performed outside of the chassis if possible. We tried it with the motherboard already installed, but due to the tight confines coupled with the location of the inlet and outlet connections on the block that sit directly over two of the mounting points, things became a little bit tricky. Like the installation of the MasterLiquid Pro 240, the bolts thread through the backplate and are held in place by the plastic clips. The bolts go through the mounting holes from the backside of the motherboard, then the cooler sits down on the over the bolts on the other side, where a thumbscrew is threaded onto each one. Each thumbscrew is tightened slightly until they are all in place, then tightened all the way in a criss-cross pattern. These can be tightened without tools, however we chose to give them a little extra lovin’ with a flat-head screwdriver to ensure maximum contact and pressure. Installation took about 15 minutes and here’s the result. 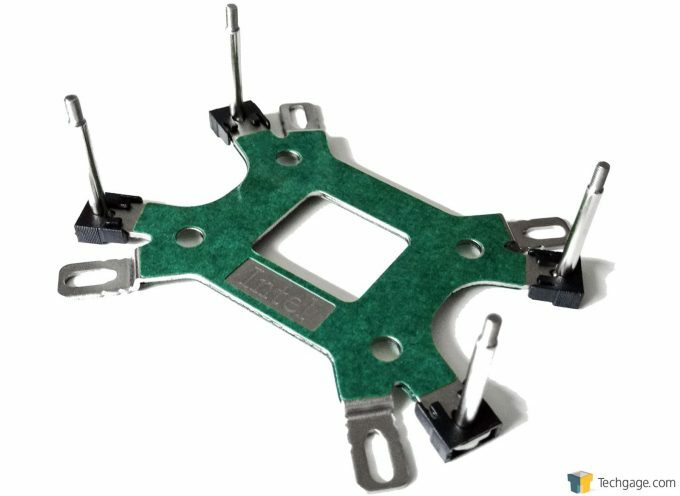 Keep in mind that the motherboard in our test system is rotated 90 degrees, so the orientation will differ from chassis with a standard layout. After all of the talk in the introduction about innovation, how could we continue on without mentioning one of the coolest features of the MasterLiquid Maker 92? With a slight push it goes from a standard tower-style cooler, to a top down cooler making it compatible with systems where space is at a premium. In fact, it can be adjusted and left at just about any angle to provide extra airflow to hot running motherboard components. A fresh, fully patched installation of Windows 10 Pro is allowed to sit idle for 10 minutes after startup to ensure all services are loaded before recording the idle CPU temperatures. CPU load temperatures are generated by performing a 20 minute run with IntelBurnTest using the maximum amount of the available memory. Normally we would use OCCT’s built in Linpack test, however we noticed that it was not pushing the cores to 100%, which is why we went with IntelBurnTest as an alternative. Stock CPU settings were obtained by reverting to the defaults within the BIOS, then disabling any features that could possibly affect the default processor speed of 3.3GHz. The maximum stable overclock frequency of 4.0GHz was obtained by changing the CPU ratio from 21 to 25 and increasing the voltage from 1.18V to 1.24V. The system overclock was then thoroughly tested to ensure stability. Since the MasterLiquid Maker 92 is Intel-only, we were at a disadvantage when it came time to see how it handled our usual thermal tests. Our new CPU cooler test rig features an very toasty AMD chip and therefore couldn’t be used, so we slapped it into a bit of a Frankenstein machine with components from our old chassis testing system. Components included the Editor’s Choice award winning Thermaltake Jing, which we tested again in order to get some “unofficial” comparison data. Our i5-661 might be getting up there in age, but it’s still fully supported by the MasterLiquid Maker 92. 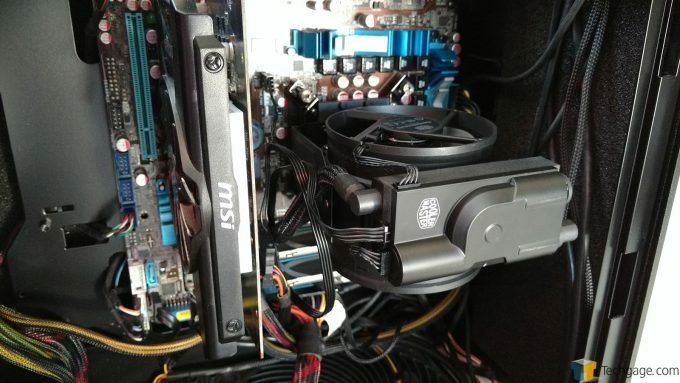 Compared to most current generation processors, the thermal design power (TDP) of 87 watts sits in the middle of the road, meaning it was able to push the MasterLiquid Maker 92 quite hard as the overclocked load temperatures reach 74 degrees. 74 degrees might not sound too bad, but comparing these results to the Jing, the picture starts to look a little less rosy. 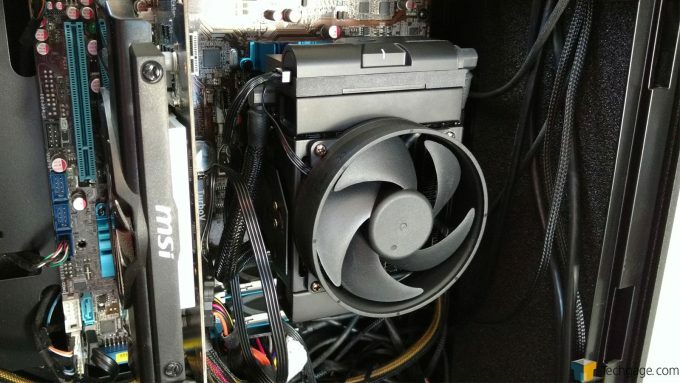 This aging air cooler bested the MasterLiquid Maker 92 by a full 5 degrees while overclocked and under full load, however it should be noted that the Jing uses two slower 120mm fans compared to the faster 92mm fans found on the Cooler Master model. On paper though, based on the amount of air being moved by the 92mm fans alone, the MasterLiquid Maker 92 should have come out on top. With the fans running at full speed during testing, the LiquidMaster Maker 92 was quite loud and drowned out the other system in the room. We don’t expect most folks to run this cooler full tilt all the time, however if the CPU is being pound on, even say 50%, we recommend running the fans at full speed because based on the numbers we saw during testing, we’re not sure the cooler could keep up otherwise. After our time with the Cooler Master MasterLiquid Maker 92, we were left disappointed by the test results, and the fact that this cooler supports only Intel systems. On the other side of the coin, we were extremely impressed by the build quality, as well as the innovation it brings to the table. It also made us very excited to think about where this type of CPU cooler could go in the future as improvements are made. For those running a system with the CPU at stock frequencies, there’s a good chance that the MasterLiquid Maker 92 will fit the bill. The fact that it can act as a tower-style or a top down-style cooler makes it flexible enough to fit some chassis that have very specific space limitations. Alternatively, those looking for a new fangled cooler that will handle an overclocked gaming rig are very likely to be disappointed with the performance, as the MasterLiquid Maker 92 simply couldn’t keep up in our comparison testing. Some might say that comparing the Cooler Master unit to the Thermaltake Jing is like comparing apples to oranges, but when it comes to liquid coolers, we’re used to seeing them either trounce air coolers, or at the very least keep pace with them. 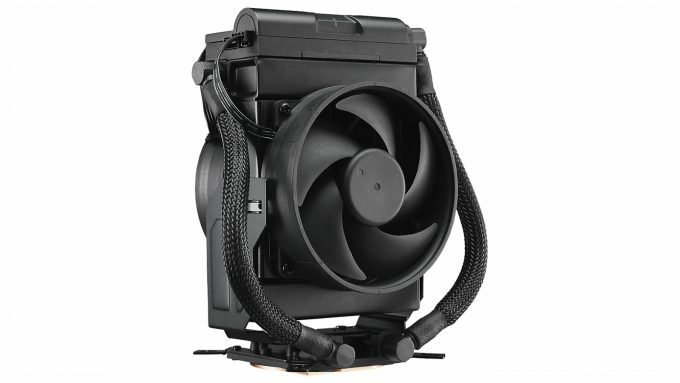 The suggested retail price for this cooler hovers around $99 USD, which unfortunately seems a bit high to us given its performance. Unfortunately, the flexibility of being able to change the layout of the cooler based on the form factor, a stellar 5 year warranty, and the fact that the MasterLiquid Maker 92 is a neat little piece of kit to look at, isn’t enough to offset the somewhat lack luster cooling performance and high price tag, especially when we consider that fact that there are air coolers that can get the job done just as well, if not better for less money. With that said, we hope for some serious performance improvements in the future and will be at the front of the line to look at the next iteration should it pop up. Excellent build quality typical of Cooler Master. Able to switch from a tower-style to a top down-style cooler. Increased compatibility even in systems with tight space requirements. Innovative design that strays far from typical AIO coolers. 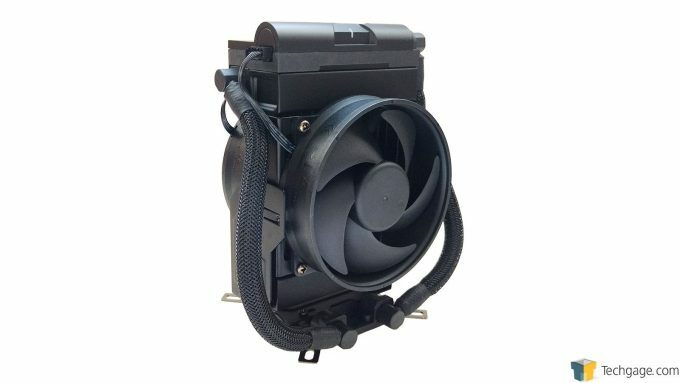 Sub-par cooling performance compared to lower priced air coolers.